The Quad-X Flail mower has been innovatively designed with a high speed rotor to pulverise vegetation cutting it into small pieces for faster decomposition. It is capable of dealing with overgrown areas of grass and weeds such nettles, thistles, and docks, making it ideal for general field use such as topping and weed control. It is powered by a 16HP or 18HP V-twin Briggs & Stratton engine, both of which carry a 3 year warranty. 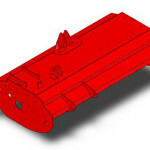 Want a Flail Mower for your tractor? Why not check out Blaney Agri for all your tractor Flail Mower needs! 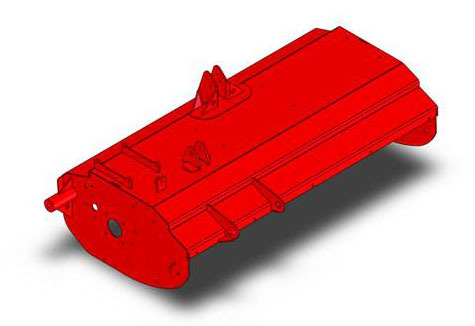 By using 3-D finite element analysis on the deck we have been able to design the mower for maximum strength and minimum weight, making it easier to tow and reducing tyre indentation on the ground surface. The Quad-X Flail mower boasts the infinite cutting height adjustable, from 20mm to 200mm to suit various types and heights of vegetation. Adjustable offset drawbar to position your machine to suit whatever particular job you are working at such as maintaining field borders. The Quad-X Flail mower has been designed with a high speed rotor to pulverise the overgrown vegetation, cutting it into small pieces for faster decomposition. The Quad-X flail mower is fitted with specially designed grass blades for cutting your overgrown areas of grass and weeds such as nettles, docks, and thistles. If you are working in more dense vegetation you can upgrade your blades to toothed rush blades. The Quad-X Flail mower has side and rear wheel positioning as standard with NO EXTRAS REQUIRED. Making it ideal for working in restricted narrow areas or for cutting and maintaining field boundaries etc. 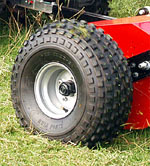 The Quad-X Flail mower comes standard with large flotation tyres to make the machine suitable for use on all areas of you farm even in the soft / wet fields. 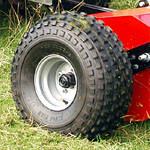 Adjustable Tow Height – Suitable for use with any vehicle whether it is a ATV, UTV, jeep or small tractor. For heavier vegetation such as rushes see our Power Shredder! The Quad-X Flail mower have been fitted with a commercial Briggs & Stratton V-Twin engine which carry a 3 year warranty. The Quad-X Flail mower is available in either a 1.3m (4ft) or 1.5m (5ft) cutting width depending on what size you are looking for.